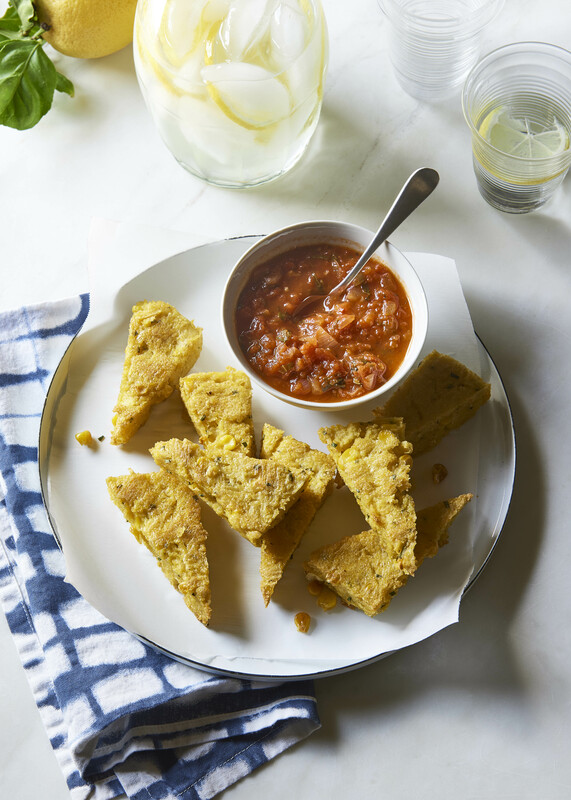 Delicious as a side dish, snack or anything in between, these Polenta Fingers with Marinara Sauce are an excellent way to keep you satisfied when you’re after something healthy and small. To make the polenta, pour in 5 cups of the broth and stir in the seasoning powder. Bring the liquid to a boil, reduce the heat to low, and whisk in the cornmeal in a slow steady stream, and continue whisking for about 2 minutes to avoid clumping. Cook, uncovered, stirring frequently with a wooden spoon for about 15 minutes adding the remaining cup of broth gradually as needed until the mixture is thick and the cornmeal is cooked through and creamy. Stir in the olive oil, nutritional yeast, garlic powder, and onion powder, and stir until well combined. Stir in the corn kernels and chives. Line a square baking dish with cling wrap, allowing the wrap to hang over the edges generously, which will allow you to pull the polenta bake out easily once set. Pour the cooked polenta into the tin and smooth over the top. Chill in the fridge for 2 to 3 hours, until set. Once set, pull the polenta out using the cling wrap, and flip it onto a cutting board. Cut it into equal pieces. Preheat the oven to 375°F (190°C), and line a baking sheet with a silicone liner or parchment paper. Place the polenta fingers on the prepared sheet, and bake in the oven for 15 to 20 minutes, until starting to brown. Gently flip the slices over, and bake for a further 15 to 20 minutes, until golden. To make the marinara sauce, warm the oil in a saucepan over medium heat, and sauté the onions and garlic for 5 minutes, until soft and translucent. Add the broth, tomatoes, basil, tomato paste, Italian seasoning, Massel vegetable seasoning powder or salt, and red pepper flakes. Increase the heat to high, bring to a boil, then reduce the heat to medium, and simmer, uncovered, for 15 to 20 minutes until the mixture has reduced and thickened. Allow to cool slightly, and thicken further. Stir in the maple syrup, and season to taste. Serve polenta fingers topped with marinara sauce.